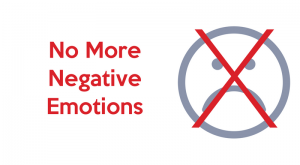 Are you ready to rid yourself of negative emotions? Wouldn’t it be nice to never feel bad again? What if I told you that you can get rid of negative emotions and bad feelings? Would you believe me? Well, it is true, to an extent. Before I tell you how though, I must first explain the difference between emotions and feelings. We often use these words interchangeably, but emotions are what we experience physically in the body, and feelings “are mental associations and reactions to emotions” (Debbie Hampton, https://www.thebestbrainpossible.com/whats-the-difference-between-feelings-and-emotions). Simply stated, feelings are what’s happening in your mind when you experience emotions. So how do you get rid of negative emotions and bad feelings? You change the label. Drop the words negative and bad and replace them with unpleasant or uncomfortable, or just drop the judgment altogether. We all experience emotions and feelings. When we judge that they are negative or bad, it causes us to want to stop them – and we often do, bottling them up, or pushing them away. Sometimes we even engage in external behaviors to help us “handle it.” But none of this helps us handle it, and if we don’t allow ourselves to fully experience emotions or feelings for fear of what might happen, we lose the potential for insights that might occur as a result of allowing them. I had the privilege to hear Dr. Joan Rosenberg talk about this recently, when she shared The Gifted Wisdom of Unpleasant Feelings. You can watch her TedX version of the talk here: https://www.youtube.com/watch?v=EKy19WzkPxE. She explains why this shift is so important. The benefit is ultimately being comfortable in your own skin. When we can allow ourselves to experience emotions and feelings and know that they will not break us, but that in fact, we will ultimately benefit from them, then we can begin to get that comfort. Sometimes it is as simple as making that shift and allowing yourself to experience emotions and feelings. But often that is difficult to do on our own. So if you aren’t comfortable in your own skin, if you’re repressing feelings and emotions or experiencing addictive behaviors to avoid them, it’s important to get help. You can seek out a psychologist such as Dr. Joan Rosenberg. You can seek out any of several avenues of help available to you. For some, it may be doing your own reading and research to help you understand things and process them. For others, it’s simply talking to a trusted friend or family member to help create that comfort. And there’s also the option of working with a coach. I am a trained neuro-transformational coach, and I have trained other coaches who do what I do. We are here to help, all you have to do is reach out. You can schedule a complimentary consultation with one of our coaches here: www.Coachseansmith.com/bookmycall or you can call our office at 805-552-4423 or email info@CoachSeanSmith.com.